So I could get a "feel" for the different geometric shapes that compose the cat. I used cylinders for the different parts of the legs, a cone for the head, a large cylinder for the body, and semi-spheres for feet. 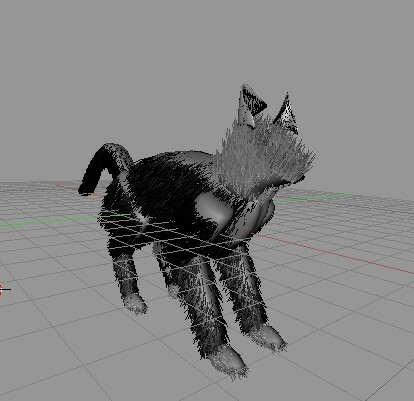 This helped me understand how the cat is put together, so that I could compose my own cat out of geometric primitives in Blender. 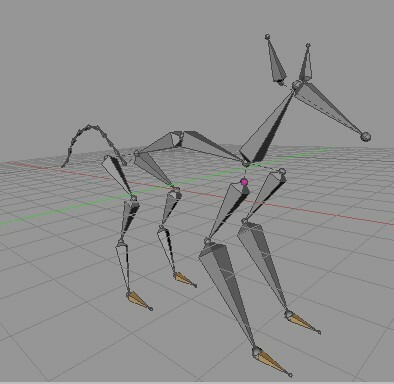 I assembled this armature inside the primitives, then parented the various primitives to their corresponding bones. I did this for both the skin primitives layer and the fur primitives layer (since, after all, they need to move together). 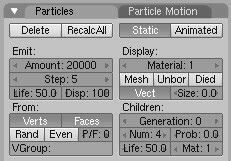 This approach seems much easier to me than trying to creat a single, uniform mesh and then select all the correct vertices to parent to the corresponding bones. 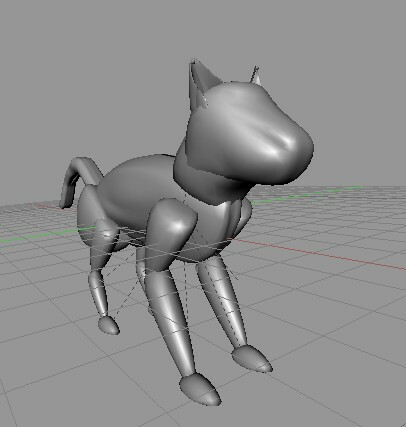 Having assigned everything correctly and played with various poses to ensure the armature was behaving in a reasonable way, the next step was to turn the disparate mesh primitives into a single, unified skin. This way, rather than looking like a cat composed of geometric shapes, or a cat wearing plate mail armor, the vertices interact and pull on eachother just like a real unified convering of skin. Mostly this was a process of trial and error, using the knife tool to cut away and remove overlapping regions, then "stitch" the vertices of two meshes together using the vertex merge operation. This meant lining up the right number of vertices between objects, positioning them in relation to eacht other, and then finally joining the two meshes into one so they could be stitched. This was probably the longest part of the process, and as you can see from the movie above I still have some work to do on the front shoulders to get them to behave more like a real cat's shoulders. 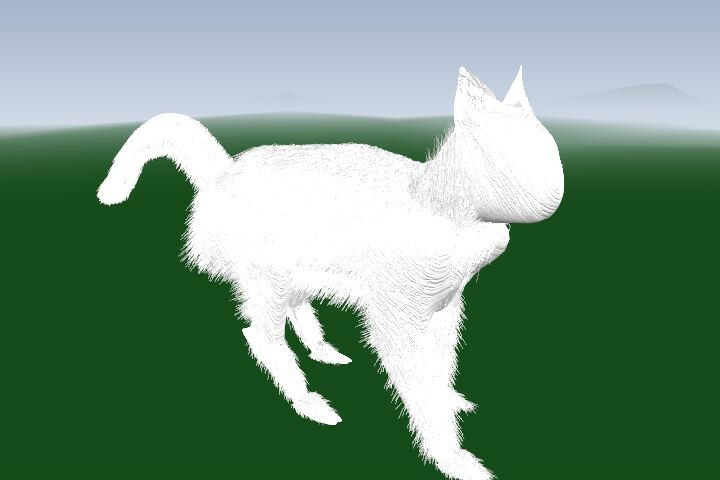 This will be especially important for the "stalking" action, where the cat's soulders often protrude while walking due to their trying to keep their torso low to the ground. Unfortunately, the "follow path" action property seems to only allow one action, and does not allow switching between different actions. 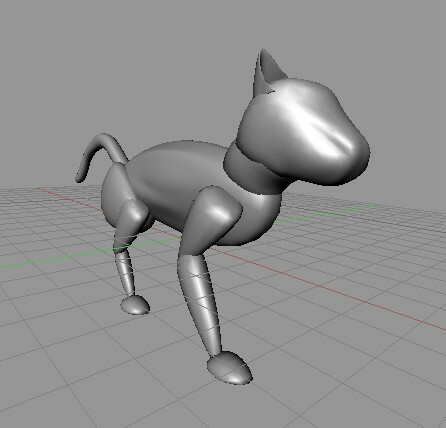 So, instead, I had to perform the distance translation for the cat's armature (with everything parented to follow along, of course) manually. However, since the rate of the three actions was constant, it was an easy equation--4BU per 60, or 12 BU for the whole movie. The result is what you see, above. Unfortunately, the uniform ground plane doesn't show off the footfalls, which due to the simple calculations above do not slip around. 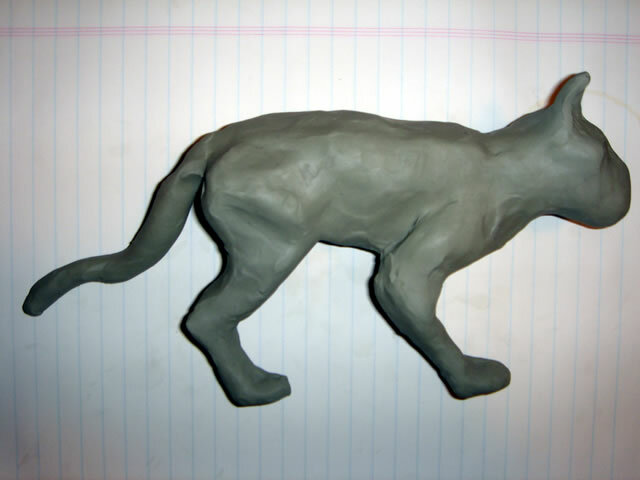 However, the camera angle also doesn't show the well-modeled back legs, either. Mostly, what you see is that I have plenty more to do, including vertex painting for the face, modeling and installing eyes, nose, and mouth, continuing to refine the fur (possibly using the fiber generator to supplement what static particles can do), and adding lots of other actions I can composite together in the NLA editor (like "twitch tail", "wiggle ears", and "sniff around") to assemble very complex behaviors just like a real cat. I'm looking forward to learning much more as I continue to improve this model, and hope to ultimately use it in a short movie. 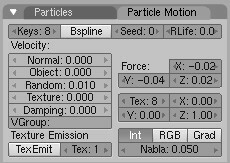 Categories: Blender 3D. Tags: Cats and Fur.